This page contains a strategy guide for the Seaside Kingdom in Super Mario Odyssey. The guide includes the location for each Power Moons in the kingdom. This page contains a strategy guide on the Seaside Kingdom found in Super Mario Odyssey. The guide contains walkthroughs for each location in the kingdom, as well as the location for each Power Moon in the area. The Seaside Kingdom is based on the beaches found in the Pacific. Its greater location is Bubblaine, which looks like a tropical beach filled with water-themed enemies and NPCs. The Regional Coins in this kingdom are shaped like seashells. 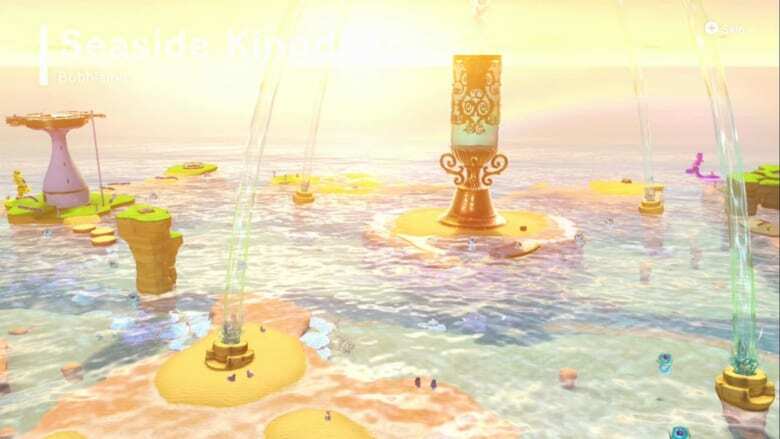 Seaside Kingdom drew heavy inspiration from France, as the boss and some areas in the kingdom have a French title. In order to summon Brigadier Mollosque-Lanceur III, Dauphin of Bubblaine, you . Capture a Gushen, an octopus-like creature, near the plugged fountain. Once you captured one, get on top of the pillar. You will see a Power Moon at the top. Take note that you must supply your Gushen with ample amounts of water in order for him to move. Get the first Power Moon on top of the pillar. You can get another Power Moon on your way to the lighthouse in the underwater sea cave near the cliff. Another Power Moon is also located in Yellow Dorie’s Store. Get the speed-boost flower at the edge of the cliff to quickly move towards the lighthouse. You can also follow the musical notes to get another Power Moon. Avoid the obstacles on the ground on your way to the lighthouse. You will see a local at the other side of the lighthouse that will lead you directly to the underwater tunnel. When you are in the underwater tunnel, capture a Cheep Cheep so that you can dodge enemy Cheep Cheeps easier. Be careful with large holes as you swim because Giant Eels will appear in those holes and try to hit you. Just keep swimming until you see a heart that can recover your lost health. Go up in the surface and go inside the warp pipe going up where it will lead you at the top of the lighthouse. Grab the Power Moon and destroy the second seal. Go back in the entrance of the lighthouse. There you need to go to the next island at the opposite side of the beach. Get the boost flowers as you travel along from the lighthouse to the next island. As you arrive in the island, you’ll get to see that it is covered in lava. Capture one of the Gushens surrounding the island so that you can get rid of the lava that blocks the island. Pour water on the lava to remove them. You can replenish the water of your Gushens by going to the northern part of the island where you’ll see a pool along with a number of Seaside Kingdom purple coins. Once the island is cleared of lava, you can dive underneath the pool to get the third Power Moon. Pound the button underneath the pool when the seal is broken to unplug the third fountain. Go to the south side of the island to proceed to the canyons. Cross the tide pools while fighting the Kelp creatures. Take note of the rumbling underneath the sand, as it can mean that there is a treasure underneath. One particular area under the tide pool contains a Power Moon. Once you reach the Canyon shore, take caution of the spiky shells that rolls down from the slope leading to the cliff where the Power Moon is located. You can also try to stack all the Goombas and lead them in the shore. There you will find a Goombette that will give you another Power Moon. Keep dodging the spikes until you reach an area where a crate is piled up in the entrance. Destroy them and proceed to the other side. Grab the Power Moon in the cliff and destroy the last seal. This will now activate the boss battle against Brigadier Mollosque. You can go to our in-depth Mollusque-Lanceur III Boss Guide or move to the next area: Luncheon Kingdom.